The Vestibule Gets a Modified Light. 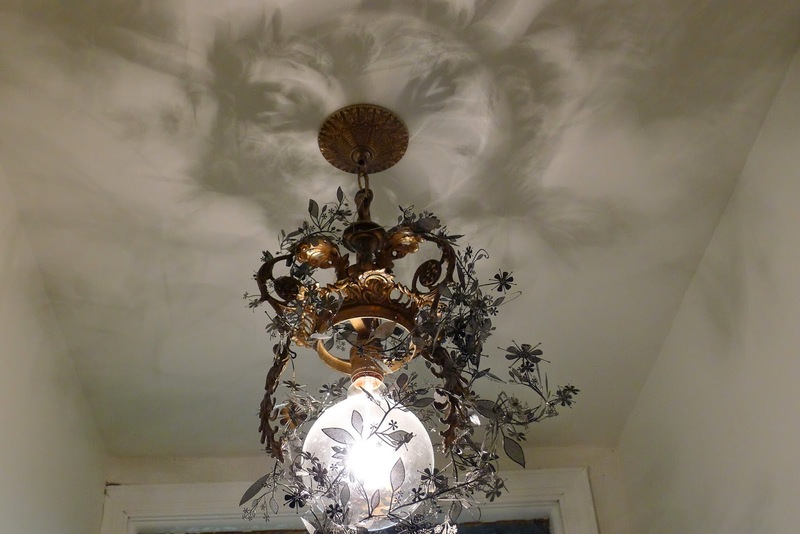 This is the light fixture in the vestibule. When Jai was born my father came to visit us from Sri Lanka and stayed with us for three months. He was a big help. Every morning on our way to work we would see him starting epic cleaning projects in our house. One day he got out the Windex, paper towels, and a chair and climbed up to clean our vintage Spanish Chandelier in the vestibule. His vigorous cleaning was just too much for the glass globe which fell to the floor and crashed to a million shards of glass on the saltilo floor tiles. I kind of liked the way the fixture looked even without the globe. I replaced the regular light bulb with a large E27 globe. The fixture still looked a little naked so I wrapped the Tord Boontje metal garland (which I had in my closet of goodies) around the brass fixture. 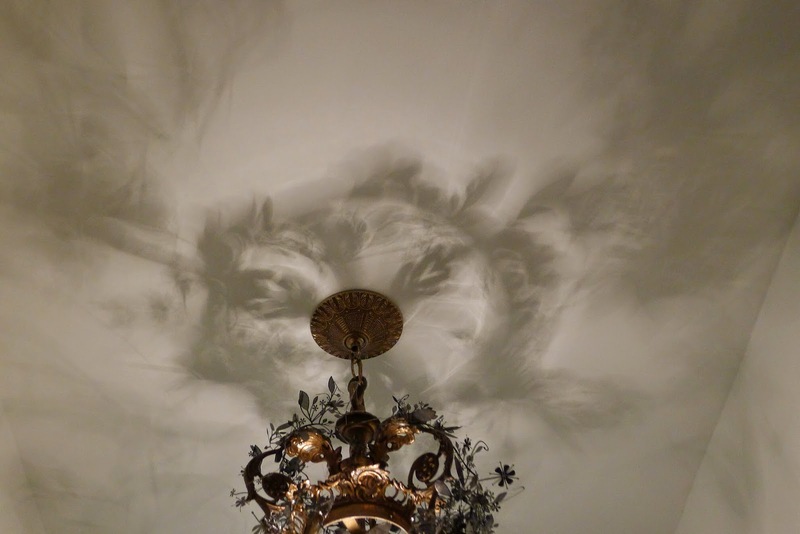 I love how the shadows from the Tord Boontje garland and the brass arms of the chandelier cast shadows on the ceilings and walls. I have to admit I prefer the way this light looks now so much better than before. I guess much like life when something happens that initially appears to be bad it could very well turn out to be something fabulous. I often feel like all the efforts we make to control our life (and kids) only takes away the magic that is waiting to happen. Every time I turn this light on I am amazed at how beautiful the shadows are how lucky I am that my dad broke that globe! « A Jungle in the Bathroom.